At last I have been able to take the time to get out this first, long overdue newsletter. The Argand and solar lamp line is expanding, and since my interest in this area has greatly increased, I am shifting the majority of my time, energies, and resources to accelerate this expansion. You are invited to visit my website at www.jptinsmith.com; it is updated on an ongoing basis, so be sure to visit it from time to time to see what is new. I will continue mailing newsletters so that those of you who do not have access to the web will be able to keep abreast of new developments. 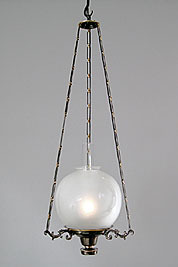 The Argand annular chandelier (left) and Argand student lamp (right) are available electrified; oil-burning versions of these lamps will be available in 2003. The solar pendant chandelier (center) is available either electrified or oil-burning (note that this photograph was taken before an appropriate, period, gold gilt finish was applied to the lamp). however, there is nothing like a firm purchase order to speed up the development of any of the other fixtures! Please let me know your interests, and be sure to call for information about cost and delivery time if you are thinking about placing an order for a particular fixture that is not currently available. Argand and solar chimneys and two sizes of a spherical solar shade with a 6 base are available to anyone who needs glass for their lamps. All glass is Pyrex and hand blown (not made from molds) by a craftsman in New Hampshire. A silver-plated brass 5 bulls-eye reflector commonly used on Argand side lamps and some solar wall lamps is also available. This fall I will be exhibiting at a number of shows in an area that ranges from Boston, Massachusetts to Williamsburg, Virginia. I also plan to exhibit at the Restoration and Renovation show to be held in Baltimore, Maryland in March of 2003. I look forward to showing you my line of lighting fixtures, tinware, and period style Christmas ornaments and answering any questions that you may have. Please take a moment and jot down any comments or questions that you may have on the enclosed post card. Also, note the name and address of anyone you know who might be interested in being added to the Argand/solar lamp mailing list (I do not share my mailing list with any other people or businesses). If your interests have changed and you would like to be dropped from this mailing list, let me know that too. And finally, please be sure to call, write, or e-mail any thoughts, comments, questions, or requests for additional information that you may have. I look forward to hearing from you. If you will also include your U.S. Postal Service mailing address, you will be sent any brochures and photographs that may be distributed from time to time. These mailing lists are not shared with any groups or individuals and, as always, if at any time you want to be dropped from the mailing lists, just send an e-mail and your name will be deleted promptly. Thank you!